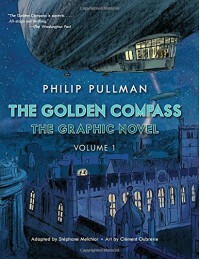 I enjoyed this graphic novel adaptation of the first parts of the Golden Compass, the first book in the His Dark Materials series. The art is nice, it follows the story really well, the characters are pretty much how I pictured them. It's a nice adaptation. The only criticism I have of it, is the fact that it seems like it's going to take forever for this graphic novelization of the series to be complete. Do I really have to wait until next September for the next book? Really? I guess I'll have to be patient. Reading this really whet my thirst to re-read the entire series, so thanks for that, as if I don't have enough to read already!